Every Year we organize blood donation camp at KLS IMER in association with HDFC Bank during the month of December. This year IMER Belagavi in association with HDFC Bank and KLE'S Blood Bank has organized Blood Donation Camp at KLS IMER on 8th Dec., 2017. Shri. Rajendra Belgaumkar, Chairman, Governing Council of KLS IMER, along with Mr. Vinay Balavalli, Cluster Head HDFC Bank inaugurated the camp. Motivational talk was arranged on 7th Dec., 2017 where in Dr. Ranjit Kangale, Professor, Dept. of Pathology, JNMC Belagavi and Shri. Ashok Badami, Hon. Secretary Indian Red Cross Society, Belagavi delivered the motivational talk and encouraged the students to donate blood and save life. 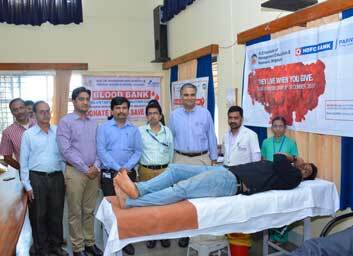 In total 78 Donors (Students & Staff) donated the blood on this occasion. Dr. S. G. Chiniwar, Director IMER motivated the students to donate blood. Prof. Ameet Kulkarni and Shri. Sunil Kulkarni, Librarian KLS IMER coordinated the event.